Eloy Alcala, left, talks to his attorney Daniel Reyes at his capital murder trial at the Hidalgo County Courthouse on Thursday, Sept. 27, 2018, in Edinburg. Alcala was convicted of capital murder for the 2010 deaths of two Las Milpas men and was granted a new trial on appeal. 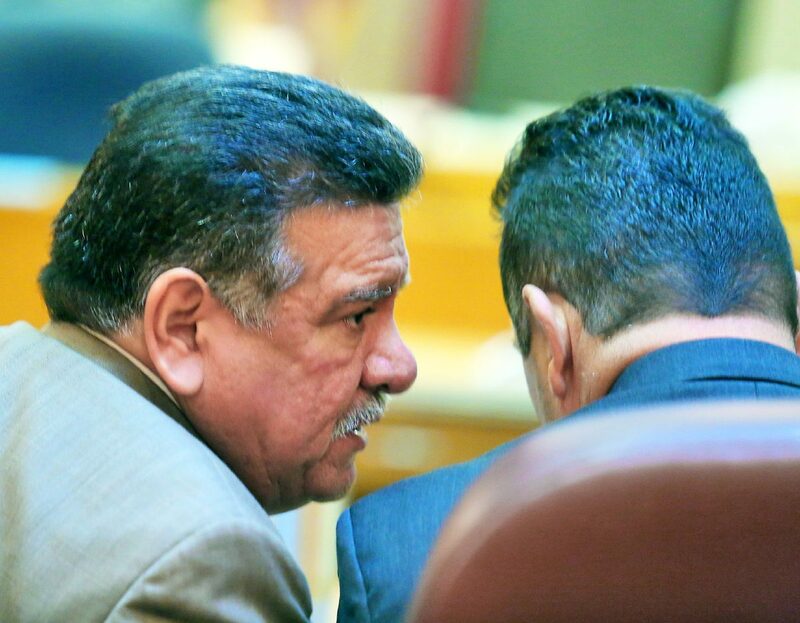 EDINBURG — Witnesses in the Eloy Alcala capital murder trial, now in its second week, have spent hours — and in some instances days — on the stand as attorneys flesh out the sequence of events leading up to and after the fatal shooting of two Pharr men nearly eight years ago. A 2012 jury convicted Alcala, 51, of the Oct. 8, 2010, deaths of cousins David Garcia III, 21, and Victor de la Cruz, 35, who were found shot outside a van on the corner of Sabino Avenue and Santa Monica Street at approximately 1:30 a.m.
Alcala is back in the courtroom after the 13th Court of Appeals ordered he receive a new trial on the grounds that his interrogation video should not have been shown to jurors as evidence at his first trial. In the week since the new trial began, jurors have heard from Pharr police officers who responded to the scene, in addition to Garcia’s mother and sister, who lived around the corner from the defendant. Officers began to suspect the Alcalas following conversations with Garcia’s family, of whom members arrived at the crime scene minutes after the shooting. Marisela Garcia testified Monday that her son David came home around midnight Oct. 8 covered in blood and told her he’d gotten in a fight with Alcala’s son, Eloy Jiovanni Perez Alcala, at the Alcalas’ residence. According to Garcia’s testimony, Jiovanni then arrived at their house and the two men allegedly engaged in another physical altercation inside Jiovanni’s Cadillac, before Jiovanni drove off and David headed to his cousin Victor’s house. According to both Garcia and her daughter, also named Marisela, the elder and younger Alcalas then arrived at their house and asked for David and his wife. After it was apparent neither were there, the Alcalas drove off in a white truck, and the Garcias subsequently saw Victor’s van pass by, traveling in the same direction as the truck. “My heart told me it was my son,” the elder Garcia testified feeling when she heard gunshots minutes later. When asked by Alcala’s attorney, Daniel Reyes, why they had not previously mentioned — in the affidavits they gave to police hours following the shooting — the alleged fight between Jiovanni and David at Jiovanni’s house, both women attributed the oversight to being in a state of shock. Prompted by questions from the defense, police testified that officers never searched the Garcia residence. Jiovanni, 29, was convicted for the murder of Garcia and De La Cruz in 2011 and is serving a life sentence at a state prison in Abilene. David Garza, a neighbor who took the stand earlier this week, testified he saw the Alcalas head in the direction of the Garcias’ house prior to hearing gunshots, a detail Alcala’s attorney Jaime Alemán questioned as to why it wasn’t included in Garza’s affidavit. Garza explained he was illiterate and that police had written his statement for him. Garza also testified that after he heard the shots, he saw the Alcalas’ truck drive up to their house with its headlights off, the son get out, and the father lingered in the vehicle as police drove by, before moving the truck onto his property. Garza said he stopped the elder Alcala to ask if he’d heard the shots, and Alcala replied that he hadn’t. Dashcam video from police arriving to the scene of the shooting captured a light-colored truck outside the Alcala residence, but the truck was not in the same spot an hour later, when officers walked the four blocks from the location of the bodies to the house. Alcala’s defense team has cast doubt as to whether Pharr police “narrowed” their search after speaking with the Garcias and Garza, effectively ruling out other suspects, pointing out that at least two officers who responded to the scene passed other vehicles leaving the neighborhood minutes after the department received calls about gunshots. Reyes and Alemán have mentioned two other people during the trial’s first week — Luis de la Cruz and Robert de la Cruz, Victor’s brothers, who police arrested in the vicinity of the murder scene Oct. 8. Luis was arrested for public intoxication after he arrived at the intersection of Sabino Avenue and Santa Monica Street around 3 a.m. According to testimony from officer Enrique Ontiveros, Luis mentioned having problems with David over drugs and said a man who went by the nickname “Corn Nut” likely killed the men. Robert was arrested somewhere on the same street as the Garcias’ house, Ontiveros added. When Alemán asked if police had taken statements from either brother, Ontiveros said he did not believe this had happened. Prosecutors from the Hidalgo County District Attorney’s Office who are trying the case issued a subpoena for Luis for the trial’s previous Aug. 27 and Sept. 17 settings, according to court recordings. These trial settings were rescheduled. It is unclear as to whether Luis will be called to testify as the current witness list and recently issued subpoenas are sealed on the county’s public access records system. The trial will stretch into next week as the state continues calling witnesses to the stand to discuss the evidence collected at the crime scene and the Alcala residence.